in order to avoid QRM and interfereance. Good for mobile WIRES-X operation (depends on mobile router). It makes easy operation in foreign country without RF license. MIC compression circuit makes clear and non distorted sound. For export model, no batteries are attached. LR6 AA Alkaline Battery 2pcs are required. - For WIRES-X, use cable 10P-6P included in HRI-200 package. - For Echolink, use interface which has DATA 6P plug (MiniDIN 6P). 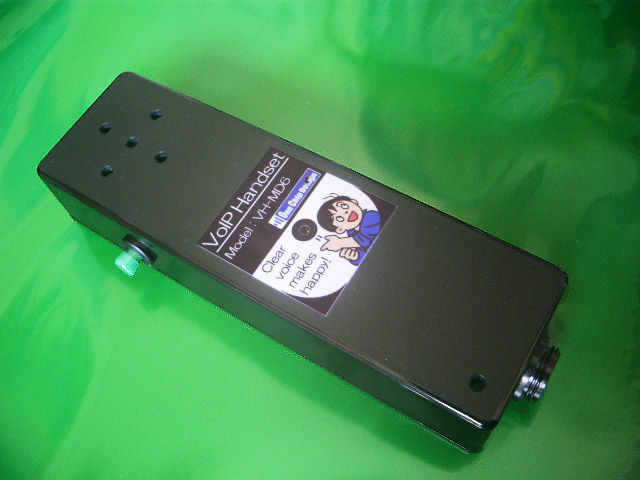 -Also, gateway(cross-linking) unit HAMSTIR X-6P can be used. 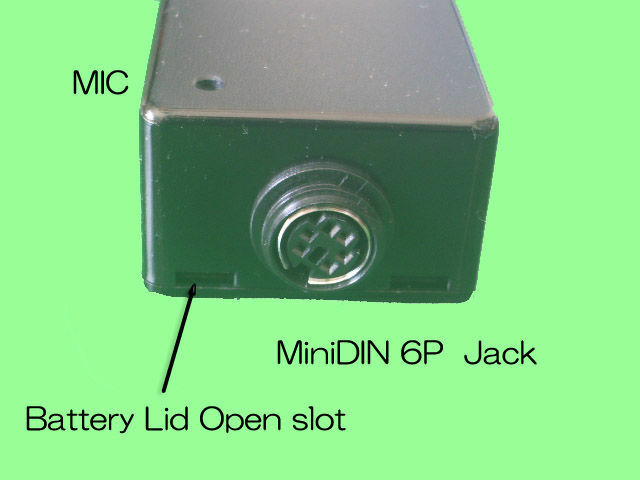 MiniDIN 6P Jack : Generic DATA Terminal spec. 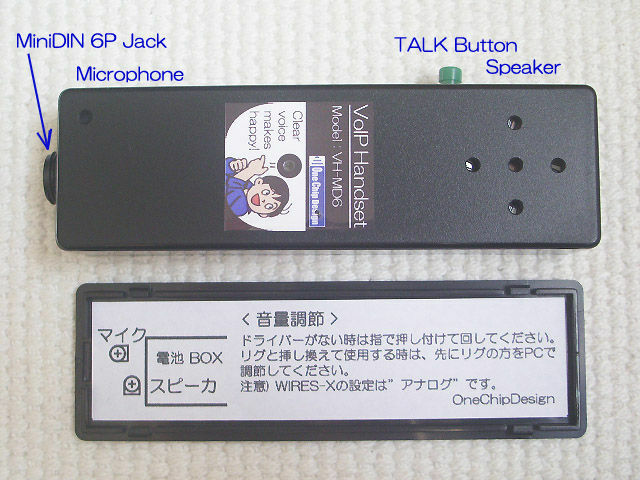 * Due to part purchasing arrangement, TALK Button color is either green or black. In WIRES-X case, [Transceiver] window, choose [RX:FM-TX:FM] (Analog). Digital can not be used. In EchoLink case, [RX Ctrl] window, choose "Serial CTS". When TALK button is pressed, current is approx.4mA . When you connect MiniDIN 6P Cable, meet it in correct angle to avoid accident. If press TALK button during receiving from network, some sound can be heard. However, no matter affects to network by the receiving priority. distorted audio sound, it will be the time of battery replacement. How to change batteries, pull up the rear lid at the point of slot, then remove it. The holding both side of main cabinet makes more hard to remove. So, better to hold the corner points of main cabinet. After removed, hold both film tape end, pull up it to remove one battery first. Next, remove remained. Before attach batteries, never forget to put film tape on battery box. When you use this alternatively with rig, adjust PC sound level first by connecting rig. After that, connect to handset, then adjust audio level by built-in SFR (SPEAKER, MIC). 1. For Speaker level, adjust by receiving actual voice. and set SFR to proper position so that red/ yellow segment starts to indicate. When no screw driver, press SFR by finger top and turn it. Also, use scope monitor in WIRES-X Audio adjustments,and set it to ideal range (broken line). * Paypal system is available and can take the payment in JPY or USD currency. * e-Bay listing is available if you wish. Send a quotation request mail first. Copy and edit below items when you send a mail. Q1 : Especially on the mobile operation, speaker sound is very low. How to get high level? 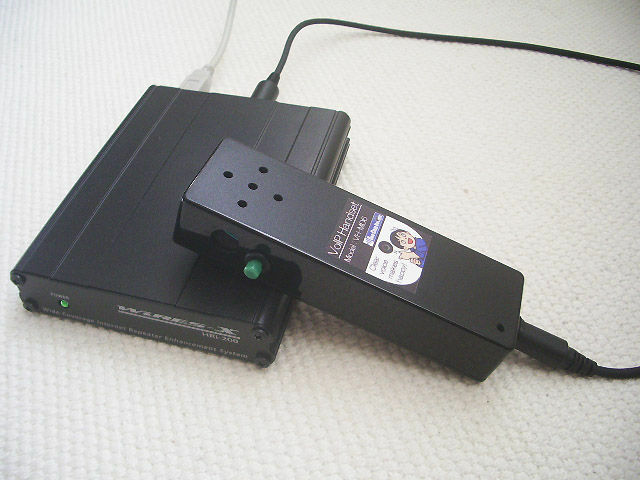 A1 : Use monitor terminal of HRI-200. Connect Speaker with high output amplifier or connect FM transmitter for car-audio. Q2 : PTT button is too small, feel pain when long talking! A2 : No space to put larger switch in cabinet. 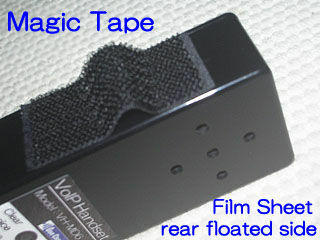 So, suggest to paste Magic tape as photo.